Rabbi Shneur Zalman of Liadi (a.k.a Baal HaTanya, or the Alter Rebbe) once remarked in Yiddish, “lieben mit di tzait” – live with the time, meaning one should live with Torah portion of the week. Last week I was taught a lesson on how the current Torah portion affects my thinking, whether I know it or not. Last week I shared with my wife, who is a biophysicist, that while thinking about system biology, I realized that all organisms – from a single cell to multicellular organisms – are Bayesian systems. I knew that the brain is a Bayesian engine, but I never heard of this concept being applied to other biological systems. This was a neat idea. This realization was a happy thought as it felt right and profound. Coincidentally, two days later, I found in my inbox a daily email from the Wired magazine. In this email, there was a link to an article The Genius Neuroscientist Who Might Hold the Key to True AI. It caught my interest, and I clicked on the link. And there it was. But first, let me explain a bit about the Bayesian systems and Bayesian statistics. In 1763, the English mathematician, philosopher, and theologian Thomas Bayes published the theorem that now bears his name. Essentially, it evaluates the veracity of a hypothesis given the newly-acquired evidence. Whereas frequentist interpretation of probability is based on the frequency of an outcome, the Bayesian probability is an interpretation of probability as a reasonable expectation, the state of knowledge or qualification of personal belief. The Bayes theorem is a method of updating probabilities, which are degrees of beliefs or assumptions, after obtaining new data. it links the degree of belief in a proposition before and after accounting for evidence. French mathematician Pierre-Simon Laplace further developed and popularized Bayesian probability. Bayesian ideas are used today, not only in mathematics and statistics, but in physics, medicine, economics, decision-making artificial intelligence, machine learning, and many other fields. Our brain is a Bayesian engine. Instead of reacting to our sensory input, it proactively predicts what to expect, based on the prior experience, instincts, or beliefs, and acts in accord with these predictions. Every moment the brain compares its predictions with newly-acquired sensory inputs and adjusts its beliefs accordingly. In other words, we don’t discover the world around us; rather we project our belief how the world around us ought to look and then check periodically to see if we are wrong about any of the details of our picture and adjust the picture accordingly. Talk about being presumptuous! While it is pretty well established that this is how the brain works, extending this notion to all forms of life is not so obvious and even counter-intuitive. Here is where Karl Friston comes in. Karl Friston. Photo by Kate Peters. © Condé Nast. Karl Friston introduced the concept of free energy as the difference between the state the system is expected to be in and the state it is found in based on the sensory input. Minimizing free energy means minimizing surprise. Karl Friston posited that all forms of life – from a single cell to multicellular organisms – minimize the free energy. In other words, all living organisms act as Bayesian systems minimizing the difference between the expected state and the actual state obtained from sensory input. Friston boldly states that this is the universal principle of life – according to Friston, to be alive means to be minimizing free energy. For anyone interested in exploring these fascinating ideas further, I highly recommend reading the above-cited article. Now, back to our Torah portion, Vayetzei. 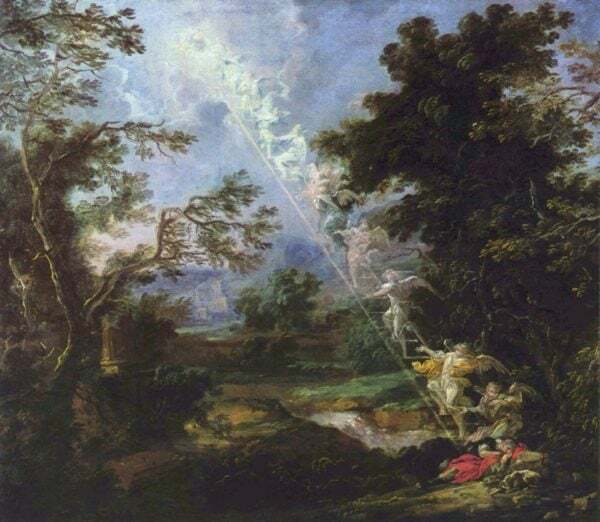 We read in this parashah about the Jacobs dream when he sees a ladder connecting heaven and earth with angels going up and down the ladder. There are many interpretations of this dream. I’d like to focus on one of them. According to the Midrash Rabba (Genesis 28:12), the angels where going up the ladder to see the celestial image of Jacob engraved on Kisei HaKavod – the Throne of Glory. There they saw Jacob in his lofty state worshiping his Creator. Going down the ladder with this image in mind, they encountered the terrestrial Jacob sleeping on the place where the Holy of Holies in the Jerusalem Temple would be built by his descendants. The angels were surprised, to say the least. In fact, they were aghast and intended to harm Jacob, if not for his awaking from his sleep that very moment. In my essay Abraham Meets Abraham from a Parallel Universe, I wrote about terrestrial Abraham meeting celestial Abraham in the Torah portion Vayera. The former didn’t recognize the latter, as celestial Abraham did not look exactly like his terrestrial counterpart. This is why, when reading the story of Binding of Isaac (Akeda) in the Torah, where the name Abraham is repeated twice, we pause between the names to indicate the difference between terrestrial and celestial Abrahams – we read Avraham… Avraham. Conversely, terrestrial Moses looked exactly like celestial Moses, which is why we don’t pause between the names when reading Mosheh Mosheh. The angels ascending the ladder looked for the celestial image of Jacob to know what to expect. When they compared that lofty image with physical Jacob sleeping on the ground, they were surprised by the difference. These were the Bayesian angels comparing their expectations to their sensory input and measuring the free energy – the difference between the two. I am not sure if Karl Friston realizes that not only physical forms of life are Bayesian, but angels as well. The Alter Rebbe told him the explanation according to Rashi. The minister stopped the Alter Rebbe and said, “I also read Rashi, and I know this explanation. I want to know how the Rebbe explains the meaning of this verse!” The Alter Rebbe explained that God asked Adam where he was – Ayekah? – at such and such age, in relation to his true potential. (And he named the exact age of the minister whose birthday was that day.) The Alter Rebbe’s lesson was that God asks every one of us – Ayekah? – Where are you relative to your true potential? This was the great lesson taught to Jacob by God in the dream. The angels of judgment constantly compare each of us with our heavenly image – our true potential – and judge us based on how short we fall of our potential. But then, perhaps, the angels are us… We all know our true potential. And we all compare where we are relative to our potential. And if we fall far short, we suffer from cognitive dissonance. With apologies to Oliver Perry, we met the angels and they are us! It strikes me that the deep insight of Karl Friston positing that life is minimizing free energy, the difference between the expected state and the actual state, is even deeper – it is not only biological principle of life but, indeed, the meaning of life – to minimize the shortfall between our potential and our present state. Now I understand why last week I came to the realization that all life was Bayesian – it is all in this Parshah! Alexander Poltorak was trained as a theoretical physicist in Russia. He is Chairman and CEO of General Patent Corporation. Dr. Poltorak served as an Assistant Professor of Biomathematics at Cornell University Medical College, as an Assistant Professor of Physics at Touro College, he guest-lectured at Columbia University School of Engineering and Business School. He is presently affiliated with the CUNY serving as an adjunct professor of physics at the City College of New York and Research Fellow at the Institute for Ultrafast Spectroscopy and Lasers. Alex Poltorak authored several books and many articles. He blogs about physics, kabbalah and Jewish philosophy.